1. When does the admission start in JIS University for PG and UG program and how does one apply? Option 1: Apply online, Upload documents. Option 3: Buy Admission Pack from JIS University campuses in Agarpara, Kolkata. For detailed information on the procedure to be followed for applying to any program in JIS University. 2. What documents are required along with the Application form and within how many days a form gets processed? A. Only a copy or scanned copy of class 10th mark-sheet and a recent color passport size photograph is required to be submitted/ uploaded along with the Application Form. Confirmation about receipt of your form is to be checked on Website. It normally takes 3-5 working days to process the form. 3. What is the significance of option 1 & option 2 in the Application Form and can I change my program from Option 1 to Option 2 after registration of Application Form? A. Students may apply for two programs under Option 1 & Option 2, e.g. MBA (M&S) and MBA (HR) respectively. Subject to meeting the eligibility criteria, you will be called for Selection process for Option 1. If you are called for Selection process for Option 2, it implies that you are not meeting the eligibility criteria of Option 1. Change is possible before selecting the Selection process date by sending mail request at admissions@jisuniversity.ac.in . 4. 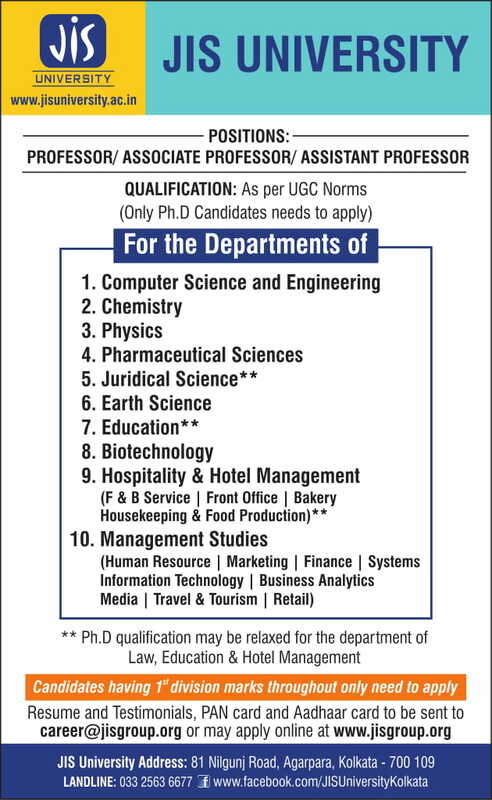 Can a student apply for UG/PG program in absence of 10+2/Graduation final year result? A. Yes, a student may apply provisionally for any course but needs to produce all the original mark sheets/ degrees at the time of Registration. However, for a PG Program aspirant, 30th October is the last date for submission of original mark sheet. 5. How many application forms one can fill while applying to various programs at JIS University? A. An applicant can apply to as many programs in JIS as desired but cannot apply for the same program more than once in one admission year. 6. What are the grounds on which a form can be rejected and is the form fee refundable or not? A. Incorrectly filled, incomplete and unsigned forms are rejected. Form once rejected will not be reconsidered and form cost will not be refunded for any reason whatsoever. 7. What is the selection criterion of JIS University? A. The selection procedure comprises of an Aptitude test followed by GD/Personal interview. Program based written test/creative/physical test is conducted wherever necessary. 8. How many Test / Interview dates will be scheduled for attending the selection process? A. The university will provide multiple dates for appearing in the selection / admission process. Admission will be in 3 Phase. Online Examination will be scheduled every Saturday. 9. What if I miss the test/interview date accidently? A. Applicants are advised not to miss too many dates as we have limited seats in all the programs. Admission is on first come first serve basis. 10. Till what time can I select the test/interview date notified on website? A.	Test/Interview date released on website should be selected 24 hours prior to the date of test/ interview. Failing which you will have to wait for the further dates to be released. 11. From where can I get the admit card? A.	Online/ Admit card link will be given on the website. You are required to print the admit card for appearing in the selection process. Applicants are required to adhere to the reporting time mentioned in the admit card. Late comers will not be entertained. 12. What all documents one need to carry on the day of selection process? A. A student needs to carry all the mark sheets as well as essential credentials in original along with the copy of admit cards. Candidates needs to carry 2 set of photocopy of all documents along with 2 Passport size colour Photos. 13. What will be the venue of the selection process? A. In JIS University Campus itself test will be conducted. Address: 81, Nilgunj Road, Agarpara, Kolkata- 700109. 14. Till what time the university schedules test/interview dates? A. Test/interview dates are scheduled until all the available seats are full. The admission committee notifies the applicant on the last date of the test/interview on the website. 15. How will I get the intimation of admission after qualifying the selection process? A. The results are intimated to the students through website & email. A hard copy of the admission letter is issued. Hence a student is advised to check the contents of website & email at regular intervals. 16. What system of education is followed at JIS University? A. JIS University follows semester system which is in conformity with the global practices and standards. Students are required to maintain minimum SGPA (Semester Grade Point Average) & CGPA (Cumulative Grade Point average) to get promoted to the next semester and qualify for Degree/Diploma. 17. What is the attendance requirement and when is the attendance calculated from? A. A minimum of 75% attendance is required to appear in the examinations. Attendance of a student is calculated from the date of commencement of program or date of fee payment (whichever is later). 18. What are the fee payment options available after selection? A. For fee payment you may either avail net banking / debit card / credit card or make the payment in DD or at JIS University Accounts Office with DD. 19. Can I make partial payment after selection so as to reserve my seat in JIS University? A. Partial payments are accepted. You are required to pay fee in full as per the deadline specified in the selection letter. 20. What if one fails to deposit the fee as per the last date mentioned on the admission letter? A. If you are not able to pay the fees within the specified date due to some valid reason, you are required to approach the admission office. Depending upon the availability of seats and decision of Admission Committee, further extension of date may be considered. 21. When does the candidate report for Registration in the Academics/Hostel and what is the list of documents required? A. Selected candidate can report for registration on the program commencement date. Candidates will not be allowed to register for the program/hostel 10 days post the commencement date under any circumstances. Hostel seat (if applicable) will automatically get cancelled. For list of documents, selected candidates can refer to JIS University Website. 22. What are the JIS Scholarship (Academic/Sports) schemes? A. JIS Scholarships are instituted to help those who are brilliant in academics and deserve world class education but don’t have the required means. Diverse Scholarships offered at JIS is On Admission Merit Scholarship. 23. What is the on campus placement criterion of the University? A. JIS University assures 100% placement assistance. In order to be eligible for the recruitment process, every student is required to achieve a minimum of 6 on a 10 point scale. 24. Is Hostel/Residential facility available in JIS University campus? A. Yes JIS University offers Hostel facilities for Girls & Boys both. 25. What are the withdrawal guidelines for the Academics? A. Refund is as per the UGC norms. Application for withdrawal from the program is to be submitted. No other mode of request will be considered.